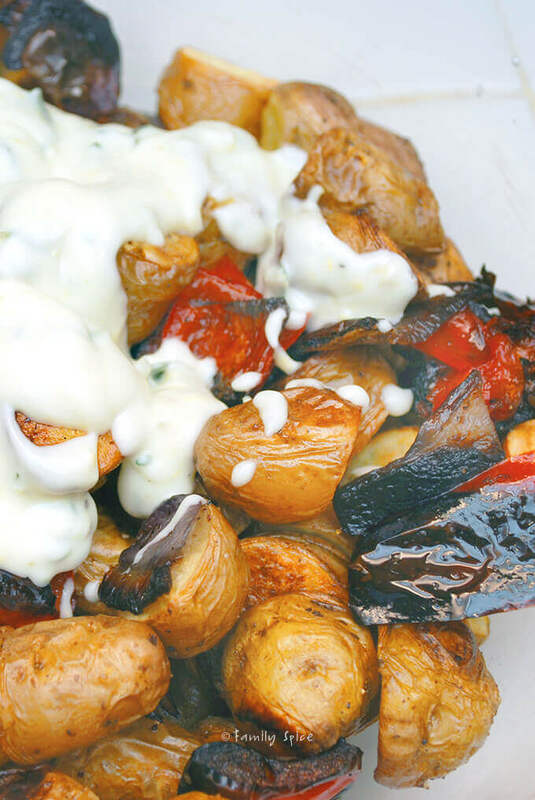 This Roasted Fingerling Potato Salad with Lemon and Thyme is tastes even better than the ‘ole boiled mushy version. Growing up, my brother and I drove my mom crazy at the dinner table. We were opposites, you see. For the holidays, I liked turkey, my brother liked ham. I hated ham, still do today. Too salty. But, my mom thought we did this on purpose. She still (to this day) makes both ham and turkey for Thanksgiving and Christmas when we get together. The same thing with ice cream, vanilla versus chocolate. Coleslas versus potato salad. Of course, we didn’t do it on purpose. Our taste preferences are still the same, although now I just don’t care for ice cream at all. So you have to understand my distaste for this month’s daring cooks challenge. My distaste for potato salad is based on the classic American version: mushy potatoes swimming in mayonnaise. Very blah, very icky and very tasteless. I still had fingerling potatoes given to be me by the Idaho Potato Commission (seriously, 10-lbs goes a long, LONG way! ), so I chose to make my potato salad my favorite way: roasted. I roasted 1/2-inch rounds of fingerling potatoes with bigger chunks of red bell peppers and red onions. For my dressing, I still wanted something mayonnaise based, to give it that American flair. Yes, Americans DO have flair. To lighten things up, I used light mayo, mixed with some EVOO. And with all things lower in fat and calories, I upped the flavor factor by adding lemon zest, lemon juice and fresh thyme, which is taking over my vegetable garden. 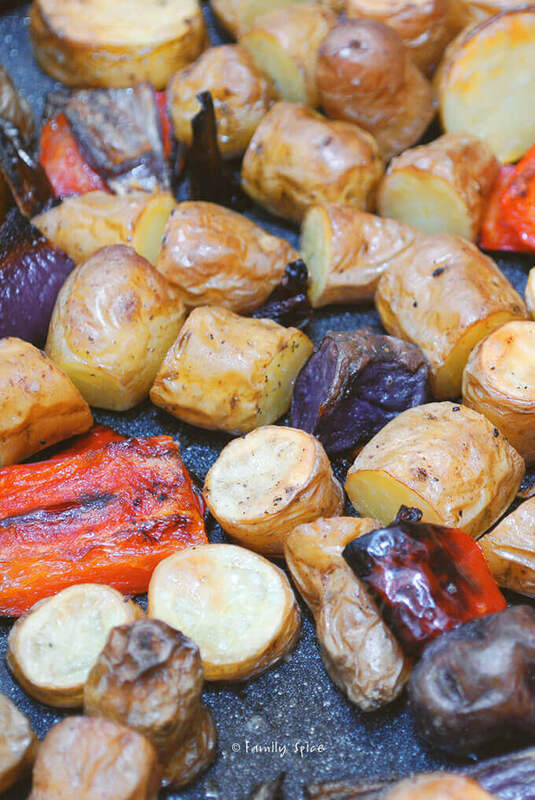 Place vegetables in one layer in a roasting pan. Keep onions in chunks, do not separate into singles or they will burn. Bake until potatoes start to brown, about 20-25 minutes. 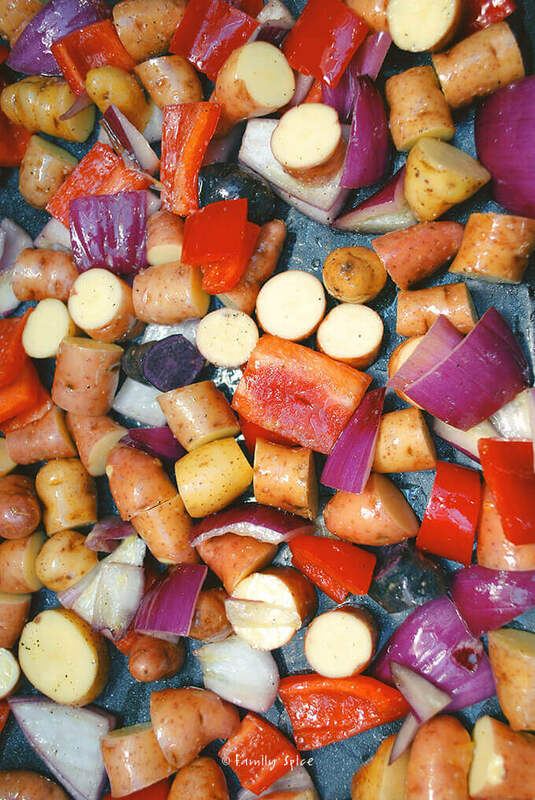 Let roasted vegetables cool to room temperature, about 10 minutes, and then mix with dressing. Cooking Tips: * To lower calories, low-fat mayonnaise can be used. You can also add 1-2 TBS of stone ground mustard for an extra kick! Fingerling potatoes always seem festive! Your roasted potato salad looks awesome. It has TONS of flair! I love your finished photo, completely drew me in. Yum! Mhm, roasting makes all potatoes better! I like the idea of thyme and lemon too. I'll have to try this one. 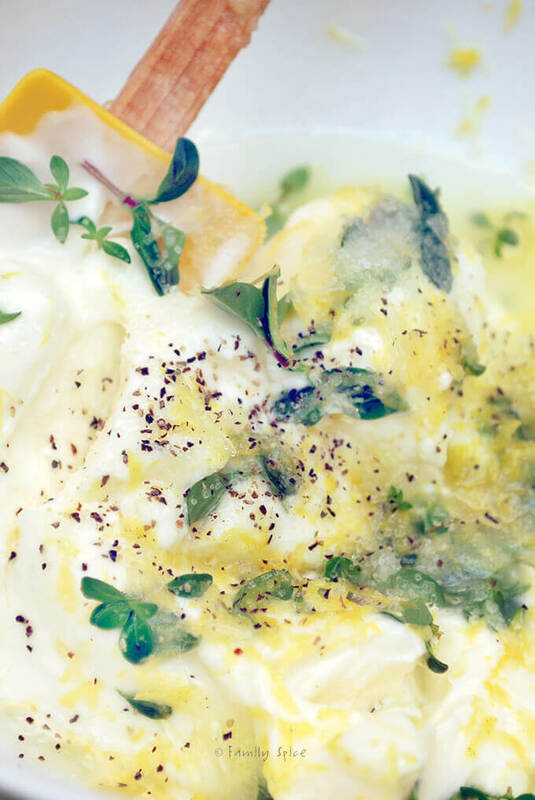 Lemon and Thyme is such a great combo on so many things!! Great salad! Ooohh – that looks delicious! 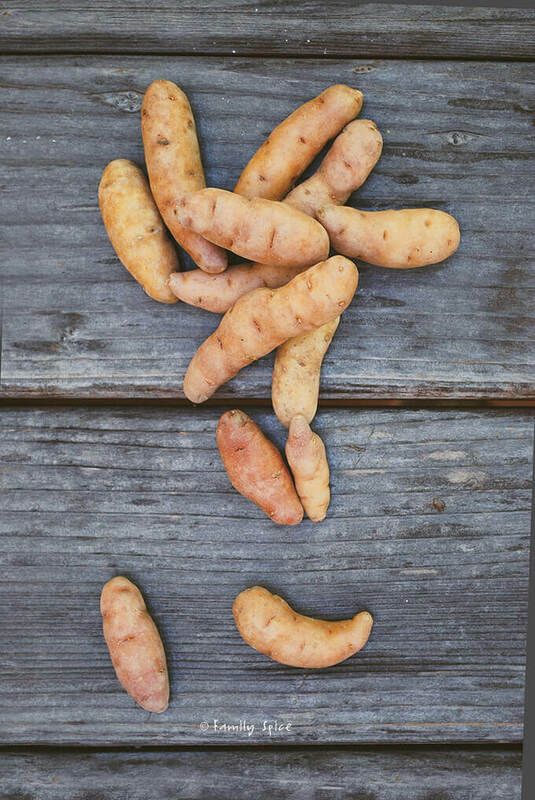 Fingerling potatoes are so fun, and such a great idea for this month's challenge! Great job. Yum your version looks delicious! Great job on this month's challenge! 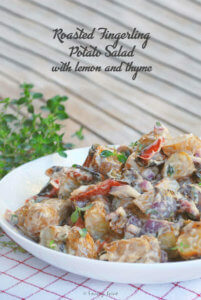 Love the idea of light american version of potato salad, thanks for sharing and good luck with the conteast. Mmmm – love the roasted potatoes and vegetables – sounds really great. Would definitely add lots of flavour! 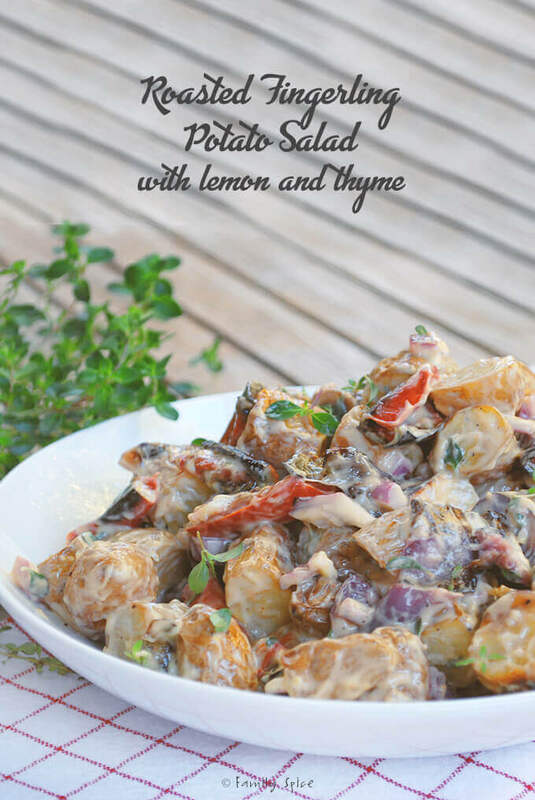 I love your roasted potato salad – thyme and potatoes is just the bee's knees! Yum! And I'm 100% with you on 'normal' potato salad – still can't bear to look at the stuff even though I am a bit of a potato maniac. First time hearing "roasted" potato salad and as a potato lover, I'm so looking forward to try this! Your mom is very nice cooking BOTH dishes of her kids like! Beautiful picture! Thanks, everyone for the compliments. This was something I made on the fly and was happy with how it turned out. RFR: I didn't have yogurt in the fridge so I didn't use it. As you know, us middle-easterners have this thing about hot/cold foods. I was always told not to mix lemon juice with yogurt. But, not everyone follows "the rules!" Beautiful colors! Do you think I could use yogurt maybe? or not? Nothing better than fingerling or baby potatoes- delicious and colorful! I'm impressed with the delicious looks of your salad. Specially because you roasted the potatoes. Looks fantastic! This looks SO GOOD! This would be the perfect side dish for the lemon-thyme roasted chicken I made for my Foodbuzz/Electrolux party last weekend. Saving this one! 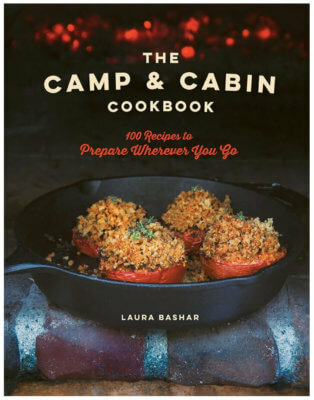 !I just joined Daring Cooks, so my first go-round is for July…so excited! !